Simply put, graffiti is vandalism. Not only does it promote a message of apathy and decay, but more importantly, it is aesthetically unpleasing and creates a perception of neglect, which in turn negatively impacts property value. 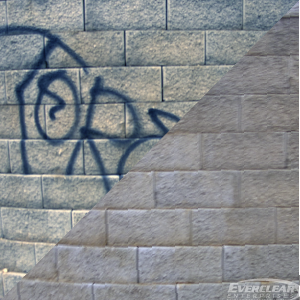 Once a property has been tagged, it has been our experience that quickly addressing the damage and removing the graffiti tends to discourage vandals from returning to the area and repeating the process. 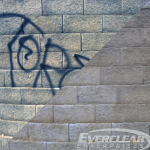 Everclear Enterprises, Inc. can assist in removing unsightly graffiti using a combination of chemicals and equipment that will not damage the underlying or adjacent surfaces. Additionally, we are very experienced at applying the latest in clear anti-graffiti coatings and surface film to protect our clients’ assets from potential future vandalism.